Former President Barack Obama gave a shoutout Friday to a Suffolk district attorney candidate in a speech that criticized President Trump and urged people to vote in the November midterm elections. 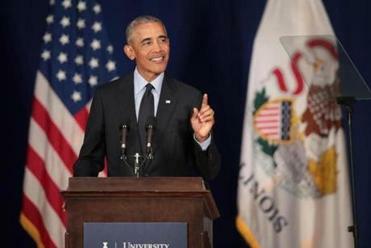 Without mentioning any specific names, Obama told the crowd at the University of Illinois at Urbana-Champaign that people in Boston elected a district attorney candidate who sees things differently, as he spoke about how the criminal justice system treats African-Americans. Obama appeared to be referring to Rachael Rollins, a self-described progressive and former federal prosecutor who won a crowded Democratic primary for the district attorney’s seat on Tuesday. Rollins’s election win this week came after Daniel F. Conley, the current Suffolk district attorney, announced in February he would not seek reelection. In unusually direct terms, Barack Obama made clear his concerns about politics in the Trump era and implored voters — especially young people — to show up at the polls in the November. Rollins defeated four other candidates, including Greg Henning — who was endorsed by Conley, former Boston police commissioner Edward F. Davis, and Congressman Joe Kennedy III. Rollins will face Mike Maloney, an independent and Brockton defense attorney, in November’s general election. If elected, Rollins will be the first woman to hold the district attorney seat in Suffolk. She became the first black female candidate elected in the primary with her win on Tuesday. Obama’s shoutout also isn’t the first time the 47-year-old received national exposure following her primary victory. On Wednesday, Rollins appeared on Tucker Carlson’s Fox News show and fielded questions about her platform. The reference to Rollins was only part of the unusually pointed speech Obama delivered on Friday as he accepted an ethics in government award at the university. In his address, the former president called Trump ‘‘the symptom, not the cause’’ of division and polarization in the United States. “As a fellow citizen, not as an ex-president, but as a fellow citizen, I am here to deliver a simple message, and that is that you need to vote because our democracy depends on it,” he said during the speech. Maria Cramer of the Globe staff contributed to this report. Alejandro Serrano can be reached at alejandro.serrano@globe.com.